This is reprinted with the author’s permission from the Arizona Jewish Post. My mother died a day before Shavuot, two years ago. Three months later, at Yom Kippur services, I knew that I was finally an adult (at age 49) because, for the first time ever, I stayed in the sanctuary for the Yizkor memorial service. A year ago, at Passover, after making her recipes without her, I sobbed through Yizkor, painfully aware that I was sitting in her seat at her synagogue and she should have been there. This year, during Passover Yizkor, to my great surprise, I found myself crying again, because it hit me — yet again, but as if for the first time — that for the rest of my life, I will be staying in the room for Yizkor, that I will always now be among the mourners. In an article reflecting on her 50-year career as a bereavement researcher, my mother wrote: “It became simpler when I stopped thinking of grief as an illness that ends. In its own way, grief lasts a lifetime. There is no universal or fixed schedule for grieving…. Children tell us that their grief changes as they mature. However, the death of a parent is with them for the rest of their lives.” My mother knew this from her research; she also knew it from Jewish tradition. Jewish mourning is guided by two principles — kavod hamet and nichum aveilim — honoring the dead and comforting the mourners. Neither of these can be done alone. Like so much of Jewish life, we need other people to respond Jewishly to death. A well-known book describing life in the shtetls is called “Life is with People.” And from a Jewish perspective, death is also with people. Mourning is by definition a lonely experience, as we try to adjust to a life without someone who was important to us. But Judaism ensures that we are not alone throughout this process. From the moment of death, actually from the moments preceding death, through the funeral, and the shiva, through the month or year of saying kaddish, and to the ongoing rememberings of yahrzeit and Yizkor, if we mourn as Jews, we don’t do so alone. In fact, we can’t do so alone. This week, as I mark the completion of my second year without my mother, I will light a yahrzeit candle and make my way to a minyan to say kaddish. Then, a few days later, I will go back to the synagogue and, once again, stay in the room for Yizkor. The Yizkor prayers remind us that even after someone dies, they too are still “with people” ­­— their memories are still with us and they are still part of our communities. On this day, as we celebrate receiving the Torah that made us a people, we will also remember those who have come before us, and those who are no longer with us. We will recite the names of our dead, and give them a place in the community and in our prayers, knowing that who we are, and who we will be, incorporates them too. My mother spent her professional life studying the mourning process. She taught that grief is not a process of letting go or of moving on; rather, it is a process of accommodating to a new life, and finding a way to continue a relationship with someone who is no longer physically present. We are lucky that Judaism provides us with a clear guide for how to do that. Five times a year — on the yahrzeit, and during the Yizkor services at Yom Kippur, Shemini Atzeret, Pesach and Shavuot — we officially pause to acknowledge those continuing relationships, and to bring them into our community’s sacred gathering. In our quiet moments alone at home, most of us remember, every day, those who have died. But because Jewish life is with people, we also need to remember them when we are together. Unlike mainstream America, where grief is supposed to be a private process, from which we “recover” quickly, Judaism recognizes that grief is a normal part of human life, which lasts throughout our lifetimes, and which we do not try to hide or run away from. As we come together this week, to celebrate the Torah and to remember our ancestors, both personal and communal, may those relationships continue to enrich and guide our lives. May the souls of all those we love be bound up in the web of life, and may all of their memories be a blessing to us. 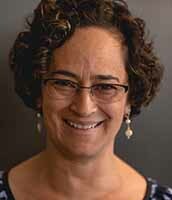 Gila Silverman, a 2017 HBI Scholar-in-Residence, is a research associate at The Hadassah-Brandeis Institute, Brandeis University, and a visiting scholar at the Arizona Center for Judaic Studies. Thank you, Gila, for writing this moving piece. Your mother’s wisdom, that “grief is not a process of letting go or of moving on; rather, it is a process of accommodating to a new life, and finding a way to continue a relationship with someone who is no longer physically present” has taught me something incredibly important. I, too, deeply appreciate Gila’s words.She is carrying on her mother’s work in how she is building the grieving process into her daily life and her own scholarship. Phyllis was a wonderful colleague in the Brandeis Women’s Studies Research Center and is missed greatly. Her writing and work have informed people throughout the world of the benefit of building collective responses to the lifelong process of grieving. I recently attended a fundraising event for The Children’s Room, a program Phyllis initiated for children who have lost a loved one, and was once again reminded of the profound difference Phyllis’ work has made. I am grateful that such a supportive community exists. How it would have helped me and my family when my four year old brother died when I was eleven.